CERTIFIED CLEAN & SAFE’ RENTAL PROGRAM NOW LIVE IN 30 EUROPEAN MAJOR AIRPORTS! We have launched a new protocol for rental car maintenance and cleanliness,Hertz Certified Clean & Safe, that is being rolled out at Hertz’s major airport locations across Europe. Through this program the company is sharing with customers each step taken to prepare every car, certifying that it is clean and safe before its rental. Once the vehicle is prepared and verified, a card with a 36 point checklist is signed by the representative and placed on the vehicle’s steering column for the customer’s reassurance. The program was previously implemented in a large number of airport and suburban locations in the US, where it received high remarks from both employees and customers on its transparency. Following its launch in Europe, the protocol has now become international. We care about our customers' safety as much as they do and by implementing this international program we make sure they know it. 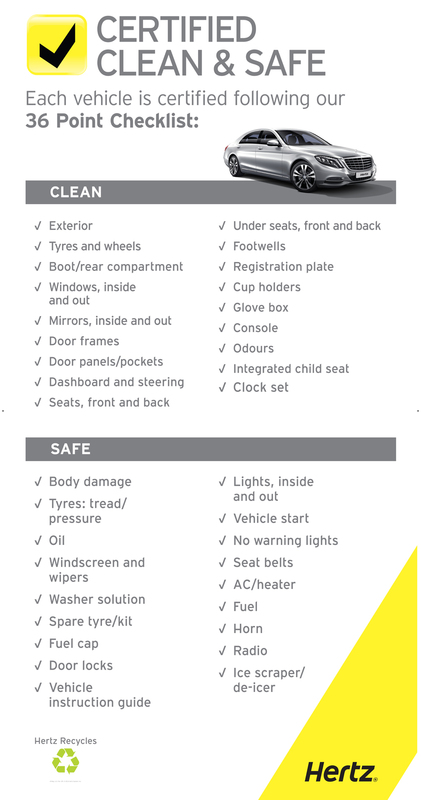 We have launched a new protocol for rental car maintenance and cleanliness,Hertz Certified Clean & Safe, that is being rolled out at Hertz’s major airport locations across Europe. Through this program the company is sharing with customers each step taken to prepare every car, certifying that it is clean and safe before its rental.We have launched a new protocol for rental car maintenance and cleanliness,Hertz Certified Clean & Safe, that is being rolled out at Hertz’s major airport locations across Europe. Through this program the company is sharing with customers each step taken to prepare every car, certifying that it is clean and safe before its rental.We have launched a new protocol for rental car maintenance and cleanliness,Hertz Certified Clean & Safe, that is being rolled out at Hertz’s major airport locations across Europe. Through this program the company is sharing with customers each step taken to prepare every car, certifying that it is clean and safe before its rental.We have launched a new protocol for rental car maintenance and cleanliness,Hertz Certified Clean & Safe, that is being rolled out at Hertz’s major airport locations across Europe. Through this program the company is sharing with customers each step taken to prepare every car, certifying that it is clean and safe before its rental.We have launched a new protocol for rental car maintenance and cleanliness,Hertz Certified Clean & Safe, that is being rolled out at Hertz’s major airport locations across Europe. Through this program the company is sharing with customers each step taken to prepare every car, certifying that it is clean and safe before its rental.